CGPSC Answer Key 2019: Download CGPSC Answer Key 2019 for the post of Assistant Professor. After the online examinations are completed, the solved question papers will be released for the candidates to calculate the score. Please go through the examination marking scheme declared at the end of the recruitment advertisement. Final scores for the online MCQ test are to be calculated based on the marking scheme. Please consider the scheme once you get hold of the CGPSC Answer Key 2019. Marking scheme, syllabus, exam paper pattern are all provided in our in-depth article for syllabus and exam pattern. The Annexure 2 that includes in-depth syllabus is also provided in the same article. CGPSC Assistant Professor Answer Key 2019 will help you to know your scores before results are announced officially. Moreover, gather details regarding cut off and selection procedure before you make any decision. In case of any discrepancy with the final scores and the result please get in touch with the regulatory authority as soon as possible. As soon as the CGPSC Answer Key 2019 is released we will link it right here. A direct link to download solved question paper is mentioned below. You will simply need to click on the link and save the Pdf to calculate the exam score. Please bookmark the page so that you do not miss the important updates and details we post here. Before calculating the final score understand the examination marking scheme. There is a specific formula declared by the regulatory authority to calculate marks. Every positive mark as well as every negative mark leads to a particular figure which then decides the score. Also, ensure that you are well aware of the cut off set. Read the commission Pdf attached to know more. The Assistant Professor Exam Result will be declared after MCQ test is completed. Commission will declare the same on its official website @ psc.cg.gov.in. Visit the website and click on the “result” option under Notice Board. To know more about the result and merit list please check our article linked below. As mentioned above the scores are to be calculated in a specific manner which is mentioned at the end of the recruitment official Pdf. Alone written test result will not decide if you are or are not selected for the job. There is an interview after written exam. Performance in both the stages matter equally to grab a seat among 1384 assistant professor vacancies. The online examination is of 300 marks and comprises 150 questions. Time duration allotted will be 3 hours. The question paper is divided into 2 parts. There would be general knowledge (of Chhattisgarh) based questions in part 1 and field related questions in part 2 of the exam question paper. 50 questions and 100 marks are set for general knowledge part and 100 questions with 200 marks are set for part 2. Part 2 of the question paper includes field related questions like botany, zoology, chemistry, physics etc. Check the Annexure 2 to know the complete syllabus for both the parts. If you wish to know more about the exam syllabus and paper pattern please check our in-depth article linked below. 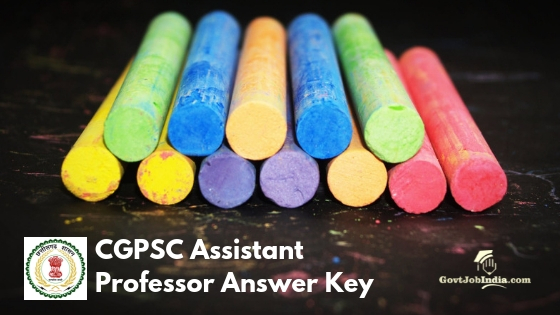 The examination dates or other details are not yet declared and yet applicants would not be able to find CGPSC Answer Key for Assistant Professor here. As soon as we get hold of it they would be added on this page for sure. Feel free to enter your doubts or questions in the comment section below. Our team will reply your doubts below the question asked. Bookmark the page to receive all that we update. If you are looking for more government job opportunities, please check our website @ govtjobindia.com. There are several options based on academic qualifications, sectors, and locations. All the best!